Ronald J. Klein, DPM, completed his Doctor of Podiatric Medicine from the Illinois College of Podiatric Medicine, in Chicago, in 1980. Following his studies, he pursued a one-year post-graduate externship where he treated and managed foot and ankle conditions for athletes of various levels of participation. Ronald has been treating patients in the Greater Toronto Area for more than 30 years, and has held several prestigious positions, including his tenure as the podiatrist at Etobicoke General Hospital, as well as acting as the podiatric consultant for Metro Toronto Homes for the Aged. He continues to be passionate about his work, which can be seen in his lectures to local sports and professional groups. 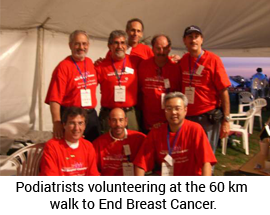 Ronald is happy to volunteer his time with numerous local charities, including walking the 60 km Walk to End Breast Cancer, where he assisted in rendering care in the medical tent as well. In addition to helping his own patients relieve foot pain and discomfort, Ronald serves as a podiatry peer review inspector on behalf of the Ministry of Health, where he visits podiatry offices throughout the province and ensures practices are maintained to provincial standards. He is also a member of the Ontario Podiatric Medical Association. Since 1999, Ronald has also regularly contributed to the monthly column, "Ask a Podiatrist", which appears in the Ajax-Pickering Metroland newspaper. During his downtime, and when not spending time with his family and 3 children, Ronald can be found alpine skiing, playing in bi-weekly games of squash and developing his new passion – and frustration – for golf. Ronald is very community minded and is available as a speaker or to provide educational information to schools, businesses, charitable organizations and faith-based institutions in the community. Ronald and his team are committed to their patients and to the community, striving to enhance the quality of life through education about proper foot, ankle and shoe care.